Although I love my iPhone and my husband owns an iPad, I never thought I wanted an my own iPad until I won an iPad this summer in a contest. It was like having all the features of my iPhone on a much larger screen. (Well, besides calling. But who uses an iPhone for calling, anyway?) Suddenly I discovered that I love the iPad. Only a couple of weeks into this term, I already see that the iPad is a great tool for a Charlotte Mason homeschool. Here are three curricula that have us constantly reaching for the iPad. I mentioned in my 8th Grade Curriculum post that we are using Harmony Fine Arts (HFA) for artist and composer study this term. Although art has always been a strong suit for us, music has not. I tend to let it slide and fall off the Charlotte Mason wagon in this area. Because of HFA, I feel confident that this year is going to be different. I already regret not getting HFA in years past. Planning for artist and composer study is not hard, yet why exert the effort when someone else has done such an outstanding job with it? 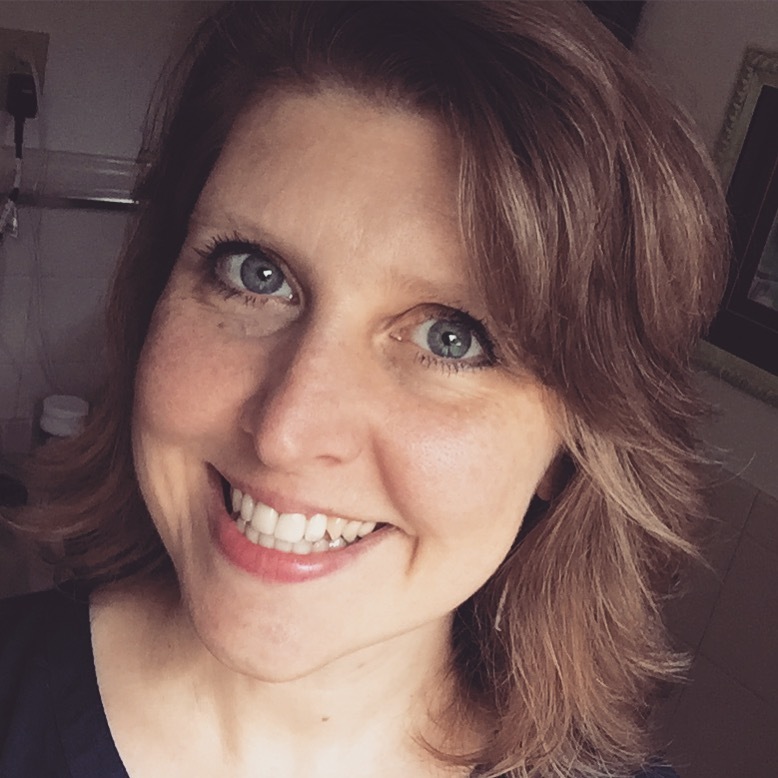 Barb lays out all you need for a weekly artist lesson and a weekly composer study. In the image, I have the iPad tilted for landscape orientation. In portrait orientation, the document fills the screen. In fact, she offers three different options with the art element. I love choices. There’s the minimalist approach, one that includes only six works of art by the artist. That’s one for each week of a 6 weeks term. There is a fuller option that adds hands-on creation of art and background about the artist along with the picture study. A third option meshes the artist study with Artistic Pursuits. Since Emma already takes drawing lessons, at home we are focusing on the paintings plus the historical information about the artists. It is all there — the paintings (or links to them), the printable notebooking pages, the links to YouTube videos, the links to biographical and historical articles. 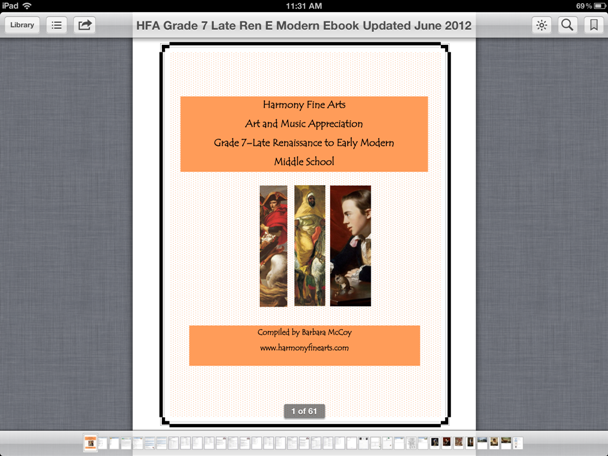 Having the iPad makes it a dream: open the Harmony Fine Arts PDF, find the assignment for the day, click on it, do it. Done. If you wonder who is covered in HFA, look at this convenient chart showing the composers and artists included in Harmony Fine Arts Grades 5-8. Since the grades are rather arbitrary, you can choose a plan based on the people and time period instead of a number. That’s what we did. With the music, we followed Barb’s suggested resource list and bought some audio CDs. The discs are even linked on her site, and I took advantage of that convenience when I purchased through Amazon. For some reason, following the plans on the iPad is keeping us on track. We are actually doing our composer study this term! 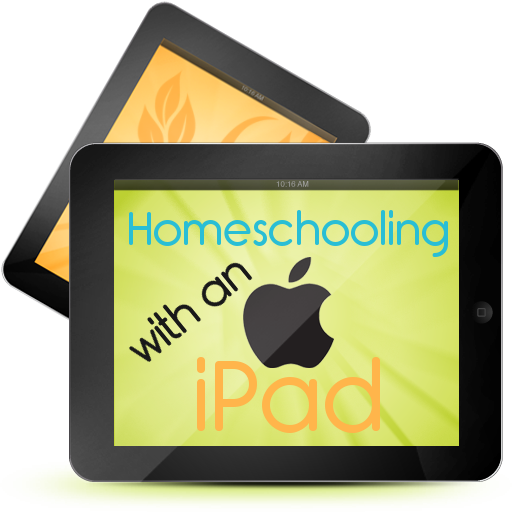 If you homeschool with an iPad, Harmony Fine Arts is super easy. Obviously, you don’t have to have an iPad or eReader to use HFA, but I will say that the iPad and HFA are a match made in curriculum heaven. Barb is offering some back to school deals that make HFA an even better deal. All the plans are discounted 20% off. 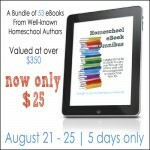 Plus everyone who purchases HFA curriculum between 8/20 and 8/31 gets a chance to win giveaway prizes (including copies of my Notebooking Success eBook). I have a crazy pride in the fact that we have made it all the way through K-8 without a single science textbook. Instead, we follow a living books approach, reading real books and using narration to check for understanding. My daughter is a very visual learner, so adding this component, especially to our science studies, greatly enriches our lessons. If you don’t have an iPad, you may think this is ridiculous because it’s not that hard to get up, walk over to the desktop, and look up something online. But the reality is that we didn’t do it as often as we do now with the iPad. 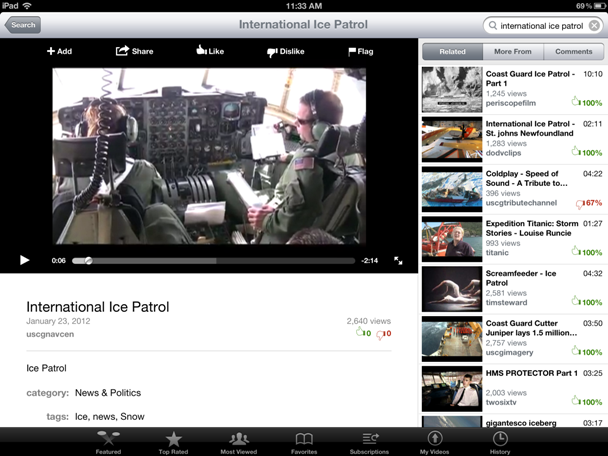 The iPad is so portable and easy to use that I find we are referencing the Internet more than ever before. It’s about the size of a book and can come with us wherever we are working. Our history is coming from the eBooks on the British Middle Ages Curriculum disc. I loved Heritage History on my Kindle DX, but let me tell you, the iPad takes it to a totally new level. These books are so gorgeous on an iPad. 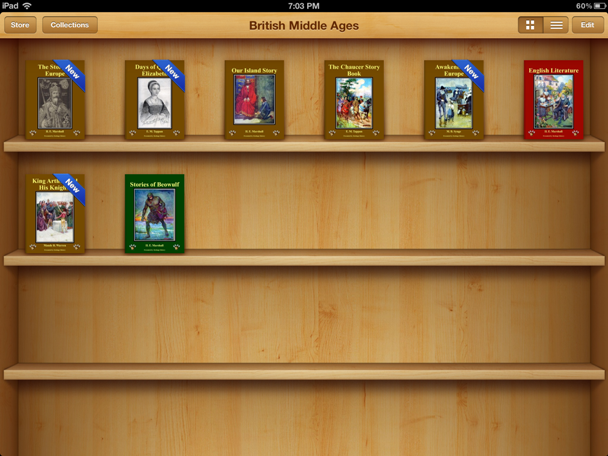 The books I selected from British Middle Ages, seen in iBooks app. Using the teacher aids on the CD, I selected the eight books you see in the collection above. I love choices! And Heritage History gives me plenty of them. These are a fraction of the 50+ books available to choose from. Best of all, the teacher guide shows me the chronological order for reading these books. I don’t have to guess or research. If the original book has illustrations, they are right there in the correct spot in the text, in full color. It’s easy to find our place each day because the table of contents are linked, and it’s easy to create and delete bookmarks. 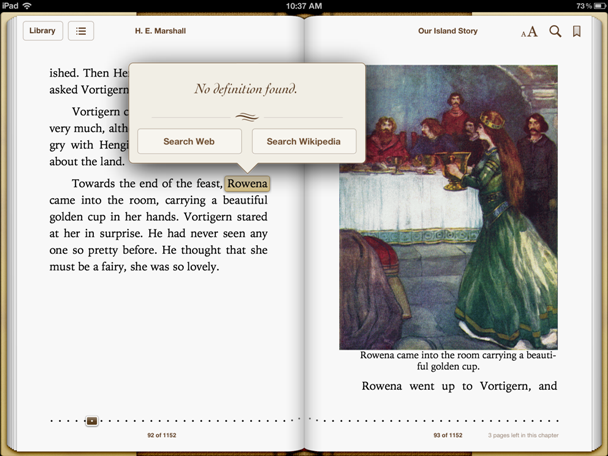 And the iPad has wonderful reference tools right inside the book. We can highlight a new word to find the definition or click over to a Wikipedia entry for more details. See why I love the iPad? You have your books and your reference tools integrated in one book sized tablet. By the way, the books on a Heritage History CD come in three different formats so you can use them no matter what eReader (or computer) you have. That means that when we made the transition from Kindle to iPad, our curriculum was still usable. We are reading and narrating for history. Very simple. Very Charlotte Mason. Until October 31, you can get a free copy of Spanish Empire library for free with the purchase of any curriculum library at Heritage History. Put both items in your card, and use code jimmiescollage to deduct the price of Spanish Empire. Disclosure: Both Harmony Fine Arts and Heritage History are sponsors of Jimmie’s Collage. However, we are honestly using and loving these materials this year. This post is written at my own initiative; I was not prompted by either sponsor to write about their material. I genuinely want to share what I consider quality, affordable curriculum choices that fit a Charlotte Mason style of education. 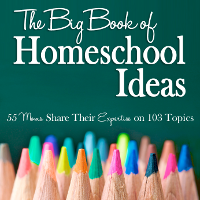 Speaking of eBooks and iPads, when tonight becomes tomorrow, the iHomeschool Network Omnibus will go live! 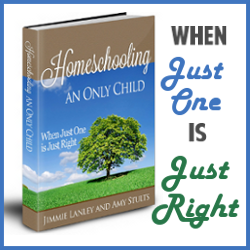 I will have a post right here on Jimmie’s Collage with the entire list of 53 eBooks that will be for sale in this huge homeschool bundle for only $25. 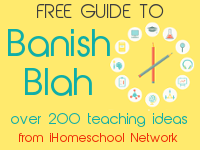 All three of my eBooks are included along with dozens of other outstanding resources. I promise you will get your money’s worth on that bundle. My husband has an ipad as well and kept pushing me to get one for homeschool, but I kept saying the computer was good enough (I am so cheap!). This spring he surprised the girls and I with an ipad and I do love it!! I am going to check out these resources as we begin 5th and 7th grades. Do you have a list of the living books for science? I am STILL trying to figure out science. We love experiments and playing with kits like Snap Circuits, but so far have not found any science programs/texts that we really LOVE. We love homeschooling with our iPad… I MUST look into Barb’s fine art plans, now that I’m seeing your post about how iPad compatible it is. Thanks for all the information, Jimmie! You actually have to be careful that you don’t go too crazy! LOL I’ve been downloading apps left and right all amazing supplements to our homeschooling and now having to delete as I’ve run out of space on my iPad – whoopsy. I love these apps and I think next year they’ll be perfect for our older kiddos! Jimmie, I don’t own an iPad. Do NaturExplorers studies work on them, or do I need to do some further formatting? Thanks for any advice you can offer! We have HFA Plans on our iPad too! It’s fabulous! 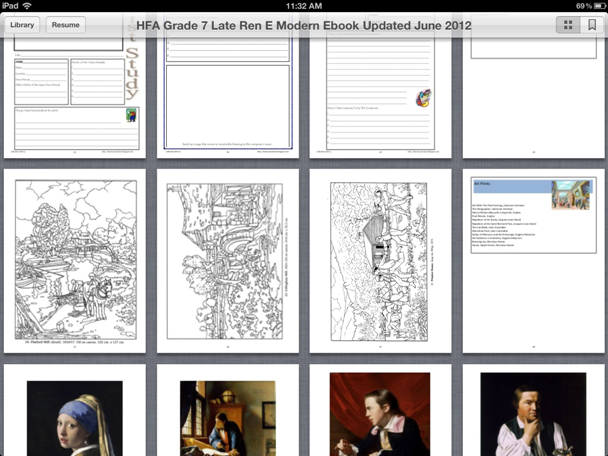 And, hooray for iBooks – I found many of our Tapestry resources I couldn’t find elsewhere. Wonderful post. Thanks for sharing the details. Thanks for these great resources! We have an i-pad and I’m looking for ways to integrate it more into our school days, I love these suggestions! We are going to buy the Harmony Arts grade 2 curriculum this year, I love the way you describe using it. Narration is such a great tool for this age, so much more natural to the child! Ok, I am new to the whole Ipad school thing. I bought the HFA 3rd grade but how do I put it on the ipad? and how do I get downloaded books from the computer to the ipad? Thanks for any help! Bethany, what I do it email it to myself. I have an email account set up on my iPad. So I email the files to myself and then open them in iBooks on my iPad. That is a paid app, but you will need it to access PDFs and other files on your iPad. I had to lol at your screen shot of iBooks. That is one of my favorite features of the iPad. Seeing all of those books lined up on my screen makes me swoon. And since we’re talking iPad and art I have to share one of my favorite art appreciation resources. Art Authority. It’s like having an art museum at your finger tips. 1000 artists 50000 paintings and sculptures. Organized by time period and artist. Simply wonderful. I think I paid $5 for it and I do believe it’s 50% off right now. We enjoy the fact that the ipad has made so many things much more accessible and convenient. Instead of heading over to the computer when we’re done (which we often eventually forgot) or lugging the laptop and starting it up (which took time and effort), the ipad is light, convenient and tap,tap, tap – so much enrichment at your fingertips. Thanks for giving everyone even more ideas of how to use it!